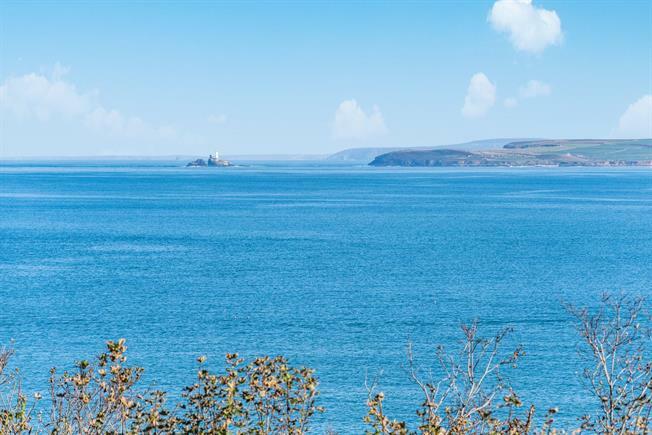 2 Bedroom Flat For Sale in St Ives for Guide Price £495,000. This stunning two bedroom apartment offer light and spacious accommodation enjoying fine sea views from the living areas. The accommodation comprises in brief of; A entrance hallway, a spectacular open plan living area with well appointed kitchen, a luxuriously appointed shower room, two generous double bedroom and a master ensuite. Outside the apartment has use of a raised communal decking area a perfect spot for alfresco dining and a single garage. A part glazed entrance doors leads off the communal hallway into the carpeted entrance hall with doors leading off into the two bedrooms, the shower room and the living area. A spacious living room with a picture window to the front enjoying spectacular sea views across St Ives Bay, carpeted flooring, spotlights and a radiator. A striking circular kitchen with a rounded cortz work surface and breakfast bar, white high gloss wall and base units, a four ring induction hob with overhead cylinder extractor fan, a integrated fridge freezer and washing machine and two single sunken stainless steel sinks with splash back. The fine sea views of St Ives Bay are enjoyed from both the kitchen and the dining area. A luxuriously appointed fully tiled bathroom, with a push button flush toilet, a circular wash hand basin, a bath with shower over with glass screen, a heated towel rail and a frosted double glazed window to the rear. A double bedroom with carpeted flooring, a built in double wardrobe, a radiator and a double glazed window to the rear. A fully tiled shower room with single shower with glass screen, a wall mounted wash hand basin, a push button flush toilet, a heated towel rail and a extractor fan. Outside the property has use of the communal decking enjoying fine sea and coastal views and a allocated single garage.